It’s not where your friends are, but how close they are that matters. After years of exact coordinate checkins, both Foursquare and Facebook are now focusing on ambient proximity — constantly and automatically sharing your approximate distance from close friends. Ambient proximity lets you know if a friend is near enough to meet up with, yet without the creepiness of seeing their every move on a map. That balance could finally make location sharing appealing to the masses. 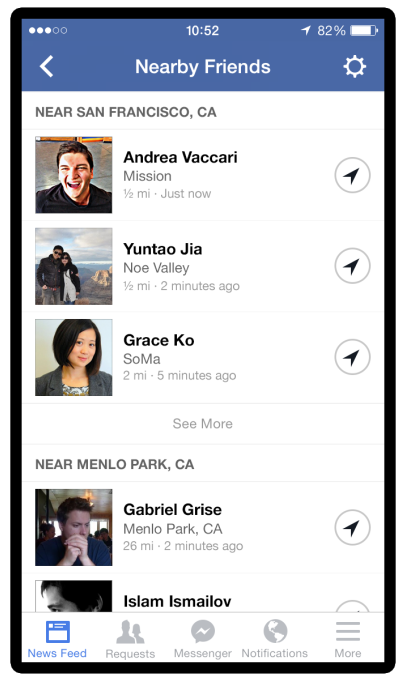 Foursquare’s new ambient proximity app Swarm was announced today and will become available in the coming weeks. It creates a feed of your best friends lumped into groups based on how far away they are, like around 500 feet or about a mile. Facebook Nearby Friends launched earlier this month and is rolling out to iOS and Android users in the U.S. Inside Facebook’s main app, the Nearby Friends feed shows the vague distance of any friends who’ve opted in, such as 1/2 a mile or 1 mile. If you want, you can send them your ongoing, real-time, exact location for a few hours. Suddenly, after years of stagnation, there are new ways to get together offline. Checkins and exact ambient location sharing certainly never caught on with the general public. The space is a graveyard, with apps like Loopt and Glancee being acquired, while Sonar, Banjo, Highlight, and even Google’s Latitude have failed to gain major traction. Facebook launched Places for checkins, but location-tagged photos and status updates have proven more popular. And while Foursquare has been at the center of the location app sphere, it only had 45 million registered users as of December. Plus, many of those use Foursquare primarily for Yelp-style discovery of local places rather than sharing where they are. The issue is that exact location is only really useful when you want to rendezvous with someone. Most of the time, either you or your friend is busy and you can’t have spontaneous meetup, Knowing precisly where they are feels a bit like spying. If you are available, it’s hard to tell whether your friend actually wants you come join them just from their checkin or moving map beacon. See they’re down the street or checked in at the local coffee house? They could be on a date, in a meeting, hard at work, or just trying to get some alone time. Dropping in can lead to awkward situations. You’re best off contacting them first to make sure. And by then, knowing their exact location ahead of time isn’t helpful because you could have just asked them. Ambient proximity solves many of these problems. Knowing someone’s current neighborhood or approximate distance from you indicates if they’re close enough to make joining forces convenient. Then you can just ping them with SMS, a messenger app, or directly through the app (in the case of Facebook Nearby Friends) to ask specifically where they are and if they’d like to get together. You can’t surprise them by showing up unannounced. Most imporantly, since ambient proximity feels less creepy, more people are likely to opt in to sharing it. These apps thrive on network effects. They get much better when a critical mass of your friends use them instead of just your most privacy-progressive, early-adopter buddies. Swarm and Nearby Friends could make it simple to join friends in the park, see who else is at a concert, find people to grab dinner with, or gather after the bars close. There will still be two major hurdles to adoption. Most quantitatively, Swarm is a standalone app that will start with zero users, and Nearby Friends is buried deeply in Facebook’s main apps. Foursquare and Facebook will have to find ways to promote them without seeming pushy. On the more fuzzy side, these companies will have to convince users this isn’t the Big Brother-esque, invasive, always-on exact location sharing of yore. And it isn’t the cumbersome checkin process either. Perhaps one day our perception of privacy will evolve to make Latitude-style, non-stop broadcasting of our exact locations feel natural. That could take a while if it ever happens, though. Ambient proximity gets the job done in a way that feels safe. After a decade of social apps suckering us into staring at screens all day, getting out on the town thanks to ambient proximity could be a literal breath of fresh air. Disclosure: I advise a college friend’s stealth social location-sharing startup codenamed ‘Signal’ that is based in San Francisco. This advising role has been cleared with AOL and TechCrunch’s editors.